Much like your life now is nothing like the life of your parents, the same will probably hold true of your retirement as well. 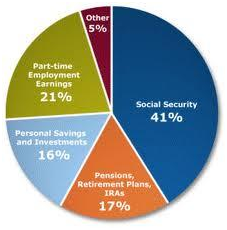 It is no longer as easy as applying for your Social Security checks and sitting back and collecting your pension. You are probably a great deal more active and will work and live longer and therefore will have to rely on income that you have saved along the way. This means you need to ensure that this income you will be saving will have the potential to last you for your entire life and be able to weather inflation, health care expenses and the ups and downs of the market. Although this might sound a bit overwhelming, it does not need to be. There are services out there such as Dinuzzo Investment Advisors that can help you cover all the bases. With that said, below are 3 strategies to help you secure your retirement income. This type of income is you contracting with a particular insurance company which asks for an investment up-front but guarantees to pay you a specific income amount for the remainder of your life or for a specific time period. It starts either immediately or on a selected future date that you choose. This type of retirement income is straightforward and along with Social Security, your pension plan and fixed annuities can provide you with a guaranteed income that will assist you with your expenses. Your insurance company will be obligated to provide you with payments for that specific time period that you chose or again, you can go with the lifetime option and you will receive payments for as long as you live. Regardless if you choose the lifetime option or the defined period, you will get those payments no matter what happens in the financial market. Variable Annuities, unlike fixed-income annuities, come with underlying options for investment which offer potential growth for helping to offset inflation. This type of annuity will guarantee payments for your entire life. However, depending on the particular specifics of the annuity, the payments can go up or down depending on the underlying investment performance. You are able to pay a little extra to get a deferred variable annuity which will guarantee you with a GMWB or guaranteed minimum withdrawal benefit so that your payments will not go any lower than the set amount but can rise in the event of market performance. Investment portfolios usually consist of a mix of short-term investments, bonds and stocks. They provide you with flexibility allowing you to typically access your money when needed, and they have huge growth potential. There is always a market risk however that is associated with investment portfolios and is why it is typically suggested that you use it for covering discretionary expenses that are necessary in retirement. If there is poor performance in the market, you can always compensate by holding back on some of the discretionary expenses. Ashley Parker has been a freelance writer for over 3 years and has experience writing in the retirement income niche.